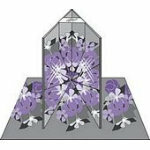 Notions > Magic Mirrors 6"x6"
Use these folding mirrors to preview your quilt blocks before cutting or sewing. You will see what shape would like like with the same printed motif in the same position on each piece. Easy to use and has complete instructions. Great for 45, 60 , and 90 degree patterns, eight-pointed stars, 6and 8piece kaleidoscope blocks, sunburst, Dresden Plate and other round designs, and many patchwork blocks that are made in quarters.